Influence is Tim's third CD, originally released in 2009 and remastered in 2014 (this product is the remastered version; the original is no longer available). This album includes tracks dedicated to people and places that have inspired his music. Tracks are written for a former teacher, his wife, church congregations, his parents, and even a dog. 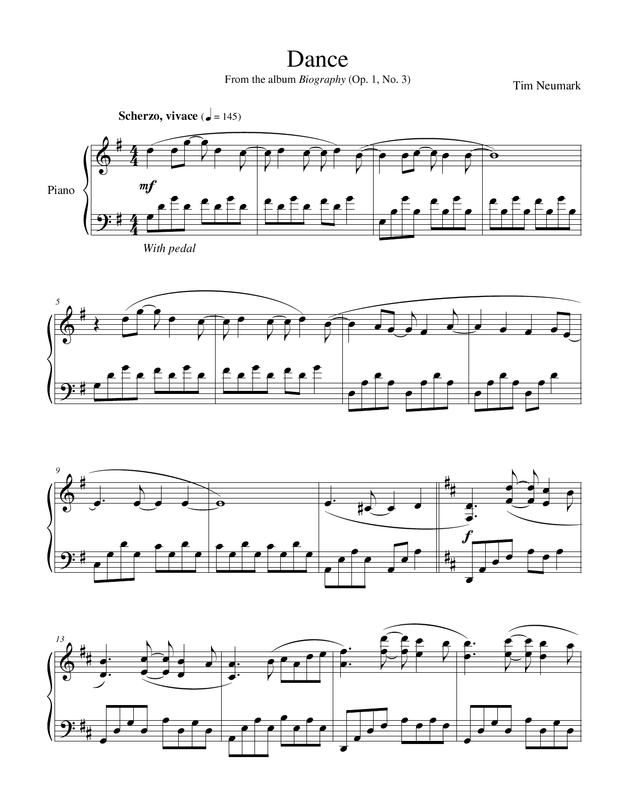 Two tracks are for his favorite composer, Antonin Dvorak, using familiar themes of Dvorak's music. 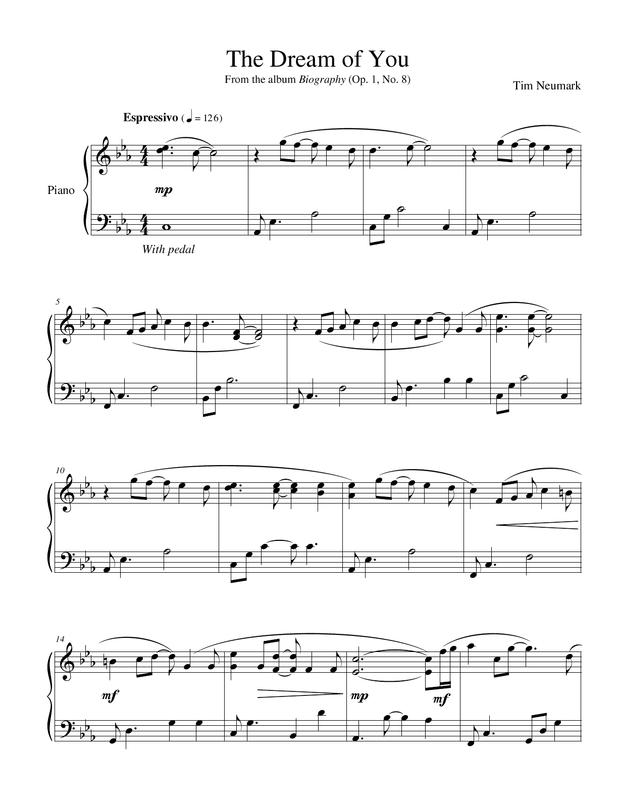 There is a range of pieces from contemplative to energetic, from classical to contemporary - there are sure to be a number of enjoyable pieces for the solo piano listener. If you like this CD, you may want to check out the song book for it as well. 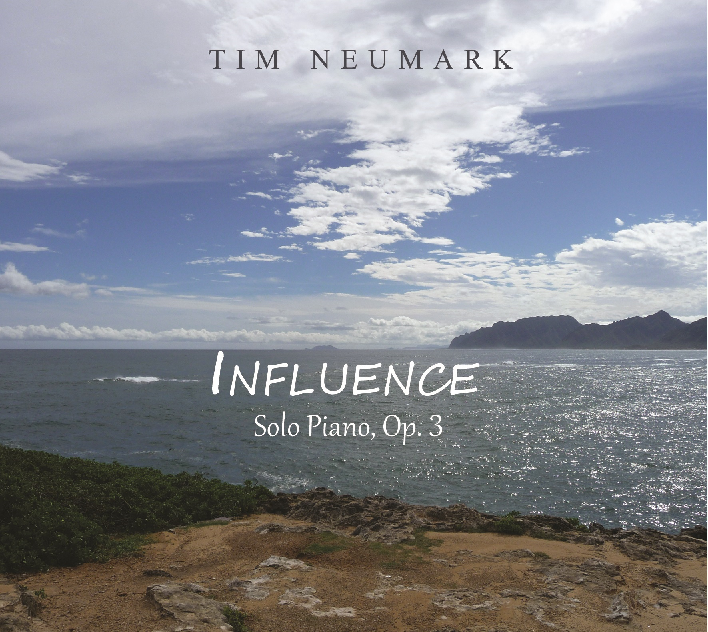 "Influence" is Tim Neumark's third solo piano release since 2007, and what a delight it is! 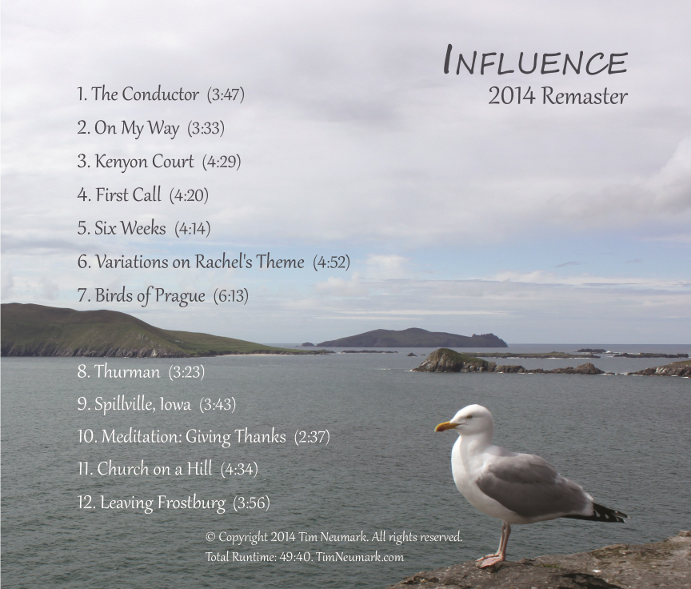 As the title implies, "Influence" is dedicated to many of the people and places that have inspired Neumark's music, and each track has a specific dedication that is explained in the liner notes. Honorees include Neumark's youth choir director, composer Antonin Dvorak, and an ever-happy dog named Thurman. The twelve pieces range from serene to playful to reflective to rather dark, creating a portrait of selected highlights of Neumark's life so far. None of the music is big or boisterous, so although the pieces are varied in mood, there are no jarring changes that would interrupt some quiet time or a cozy meal. "Influence" opens with "The Conductor," a piece dedicated to Neumark's teacher and youth choir director. Warm, tender, and affectionate, Ms. Croft obviously holds a very special place in Neumark's heart. The lovely melody for "On My Way" popped into Neumark's head as he was driving home - wistful and slightly yearning. "Kenyon Court" is one of my favorites. Quietly reflective and very melancholy, the deep emotions expressed go right to the heart. "Six Weeks" is another favorite. 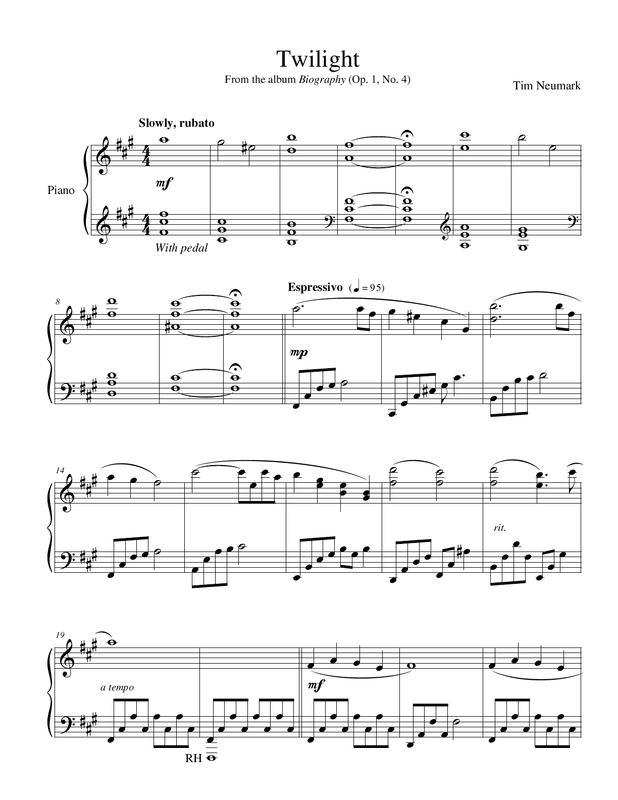 Written for the time span when both of his wife's grandparents passed away, it is a gentle love song that celebrates a long life together. "Birds of Prague" is a tribute to Antonin Dvorak, Neumark's favorite composer. Incorporating bits of some of Dvorak's music into the themes, the piece reflects the ease and grace of birds flying - something Dvorak liked to watch. "Thurman" is a lively and joyful tribute to a very happy dog that belonged to a family Neumark lived with in 1998 while playing baseball - laughter set to music! All of Neumark's albums include a meditation piece, and this one is "Meditation: Giving Thanks," an "expression of thanks for the ability to write and share music that others enjoy" - beautiful! "Church On A Hill" has a serene tranquility combined with a gentle flow that is truly exceptional. Inspired by the two church congregations that gave Neumark his start as a performer, it is a song of heartfelt gratitude. The closing track is "Leaving Frostburg," a piece composed in honor of Neumark's parents, who recently retired and moved from their thirty-year home to be closer to family. Warm and nostalgic, it is a loving tribute. I can't imagine a more fitting way to celebrate the people and events in ones life than with a collection of deeply personal pieces such as this. Tim Neumark has poured heart and soul into "Influence" and has created an enduring gift to share with everyone. Recommended! Leave your own review at the reviews page.